Preheat the oven to 375 degrees. Split the zucchini in half. With a spoon scrape out the seeds, digging a trough in the center of the zucchini. Blanch the zucchini in salted water until just soft, but the color still remains (about 6 to 8 minutes). Refresh in cold water. Pat dry with a towel. For the filling: Heat the olive oil in a sauté pan. Sauté the onions until translucent. Add the garlic. Remove from heat. Add tomato, breadcrumbs, lemon zest, fresh herbs and grated cheese. Lightly season with salt and pepper. Place the filling down the center of the zucchini. Place the zucchini on a nonstick baking tray and roast in the oven until the topping is lightly brown (about 12 - 15 minutes). 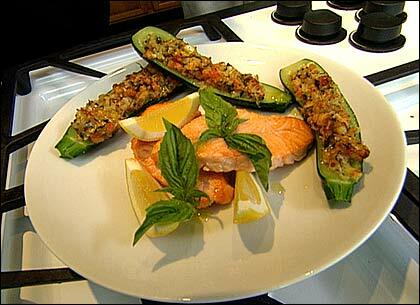 Serve as a nice side dish with grilled meats or fish, or as an appetizer with a green salad.